Instead of starting with a traditional roux, this Four-Cheese Mac and Cheese begins with a sauce made from Hood Cream, Hood Sour Cream, and cream cheese. Add in three more cheeses and the result is the creamiest most flavorful mac and cheese you've ever had! Heat oil in small saucepan over low heat. Add peeled garlic cloves. Cook over very low heat until soft, about 1 hour (do not brown). (note: confit garlic can be made up to one month ahead. Keep refrigerated and completely covered in oil). Combine Hood Heavy Cream, Hood Sour Cream, and cream cheese in large pot over medium low heat. Let the cream cheese melt and stir in the three shredded cheeses. Continue cooking over medium low heat, whisking constantly until cheese has melted. Add all other ingredients (including the 3 cloves of confit garlic, reserve remaining cloves) except parmesan and mix with a hand blender until combined. Add cooked pasta and parmesan cheese to pot and stir to coat in sauce. Cook until hot and slightly thickened. 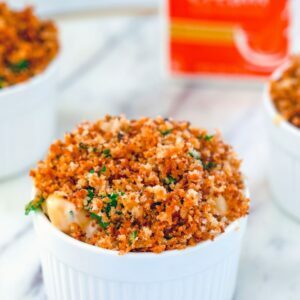 Pour Mac & Cheese mixture into a casserole dish or in individual ramekins, top with herbed bread crumbs, and serve. In a large sauté pan over medium heat, melt butter with garlic until garlic is lightly toasted. Add panko bread crumbs and toss gently. Stirring occasionally, allow panko to slowly and evenly toast in the butter until golden brown. Season with salt. Remove from heat and toss in a medium mixing bowl with the chopped parsley. You only need 3 cloves of confit garlic for recipe, but I recommend making it all as you can store in airtight container in fridge and use over the next 2 months.